Great cities have Great Fires. Portland’s was on August Second, 1873. 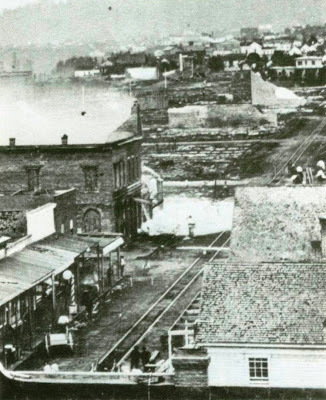 Portland in the early 1870s. Note the original line of Park Blocks, from one end of the city to the other, were starting to be breached by development. –Samuels Directory for Portland Oregon 1873. 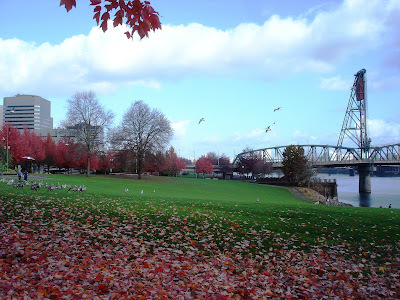 Portland 1873: thriving, confidant and rapidly growing. Despite dirt streets, wooden sidewalks, saloons and livery stables, the frontier character of the city was rapidly vanishing. 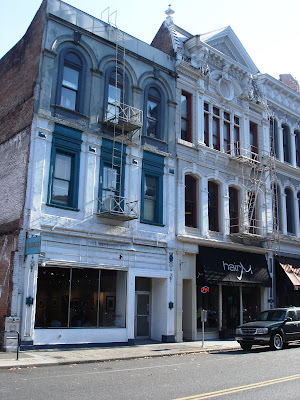 In downtown, brick and cast iron were replacing wood as the building materials of choice. There were one hundred eighty-nine street lights in place; ninety four gas fired, ninety five oil. The Fire Department comprised of five volunteer companies, each with their own station house. The department had thirty-six cisterns with a combined water capacity of five hundred seventy two thousand gallons. There were twenty-two fire hydrants. The city had a gas company and telegraph service. There were thirteen churches, two synagogues and six public schools (including a “Chinese Night School”). The library had 334 members and 5,448 books. 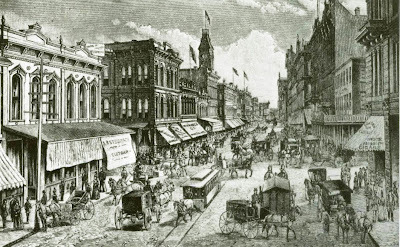 First Street circa 1872, just prior to the building of the horse car line. 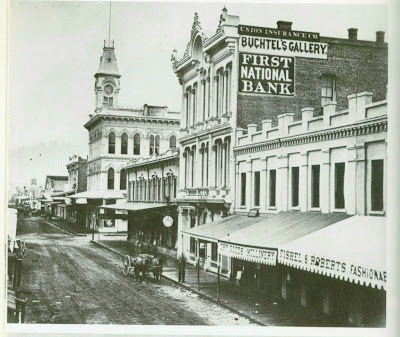 The Corbett Building (the First National Bank, 1870) was demolished in 1956. Its cast iron façade was shipped from Baltimore around the horn, the only one in Portland to do such. Beyond it, the Odd Fellows Temple, (1869) was Portland’s tallest building at the time. It was architect Warren H. William’s first in Portland. The building was demolished in 1954. The tower was removed years earlier. In the center downtown on First Street was the Odd Fellow’s Temple, the city’s tallest building, three stories high with a clock tower that rose thirty-six feet above the roof. The Newmark Theater (still existent), the largest entertainment venue north of San Francisco, was nearing completion on First and Ash Streets. Halfway between them was the cast iron magnificence of the Ladd & Tilton Bank on the south west corner of First and Stark. Up and down First Street was Portland’s first mass transit, The Portland Street Railway Company; a horse car line. Portland was a river city, but not a city of bridges. 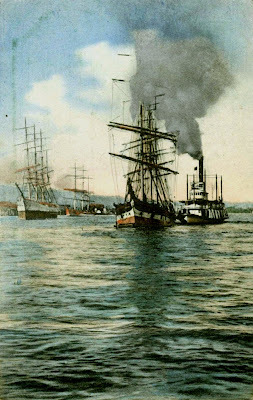 Ferry boats crossed the Willamette, dodging riverboats and tall-masted schooners filled with wheat for England, flour for California and lumber to everywhere, for ports such as Hong Kong and the Sandwich Islands. Commerce flowed from the back of the warehouses which faced Front Street. Across the street, on the south west corner of Front and Morrison, was the St. Charles Hotel, Portland’s finest, conveniently located for river travelers. -Advertisement from the Democratic Era, April 11, 1872. On the other side of the river was the City of East Portland; rough hewn and randomly laid out along the marshy inlets of the east bank. East Portland was the fiefdom of Ben Holladay. 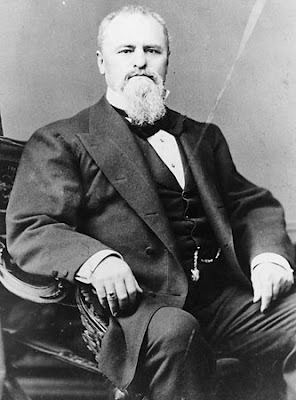 The former “Stagecoach King” was now a railroad magnate. Although Portland would not be connected to the national rail network for another decade, there were two local railroads and both were owned by Holladay. 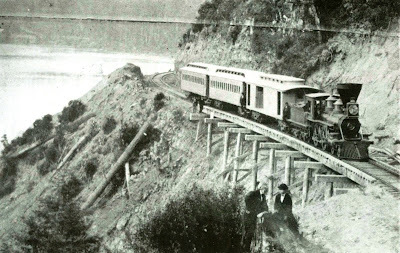 The Oregon & California Railroad was building to south to the border, but had stalled in Roseburg, two hundred miles from its East Portland terminus. 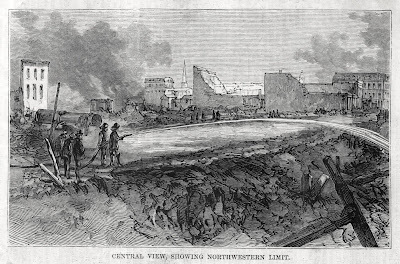 On the west side, the Oregon Central ran from Portland to St. Joseph. It had been founded by Portland’s Front Street oligarchs, but later purchased by Holladay when it ran into financial problems. 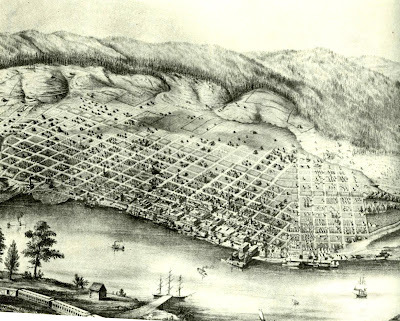 Holladay for his part saw East Portland as the regions eventual metropolis and gathered up land accordingly. First Street, Portland Oregon through booster’s eyes; a broad, incredibly crowded thoroughfare with over-sized buildings and the Portland Street Railway running down its center. Strife between the Front Street and Holladay factions aside, there was wide spread optimism and excitement about Portland’s prospects. Much of it centered around the construction of the Portland, Dalles and Salt Lake Railroad, which was anticipated to increase local business a hundred fold and double the city’s population within five years. 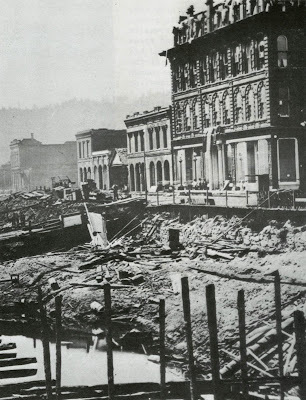 An ordinance was passed allowing the railroad to construct the city's first bridge across the Willamette from Columbia Street in Portland to Asylum Street (Hawthorne) in East Portland. It would include road and a rail alignments. The previous year, there were 1,654 arrests in Portland, in a city with a population under twelve thousand. There was concern building about the spread of alcoholism and the encouragement offered by Portland’s myriad saloons. News from the eastern financial markets was not good. The Oregon & California Railroad’s construction was stalled in Roseburg. Chinese laborers, brought in by the shipload through the services of labor merchant named Wa Kee, were returning to Portland. Labor prices were falling. It was a welcome development for the Portland’s business elite, not so for poorer workers. Or the nativist lunatic fringe. In first half of July 1873, letters began to appear, slipped under the doors of some who employed Chinese workers. The letters, some written in red ink “in the manner of the Ku-Klux and the Commune” warned that the employment of Chinese had to cease in Portland. If not, in two to three weeks time, arrangements would be made to convince the public of the danger of hiring the Chinese. 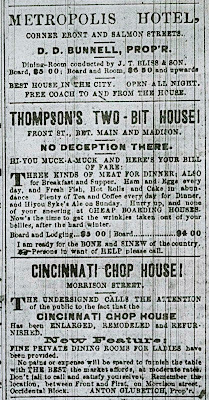 Advertisements in the Daily Oregonian from June 18, 1873 for the Metropolis Hotel, Thompson’s House and the Cincinnati Chop House. 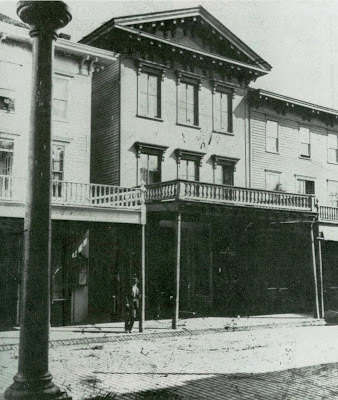 About 4:30, Saturday morning, August 2, 1873, Officer Mercer of Portland’s Police Department was finishing his rounds near Hurgren and Shindler, a furniture store and workshop on the south east corner of First and Salmon, when he saw a flickering glow behind the building. “Fire!” he yelled, and again, over and over. The cry was taken up by waking neighbors. Inside the store, a salesman who slept in the building woke and was quickly driven out of the building by the advancing flames. Soon the furniture company’s magazines of oils and varnish began to ignite. -The Dailey Oregonian, Monday August 4, 1873. Warning bells rang throughout the city, from the tower of the Odd Fellows Temple and the five fire houses. Hundreds of people poured into the streets. Columbia Engine Company #3, its engine pulled by horses through the streets with breakneck speed, arrived at the burning buildings and deployed. Thomas Lawson, Columbia #3’s Foreman, grabbed a ladder and climbed to second floor of Hurgren and Shindler. He was partially through the window when a blast of hot air and cinders hit him full in the face. He whirled around, lost his balance and fell fifteen feet to the ground. Unconscious, he was taken away for medical attention. The open space on the corner of SW First and SW Salmon, next to the offices at #26 SW Salmon, was the site of Hurgren and Shindler, furniture sales and manufacturers. 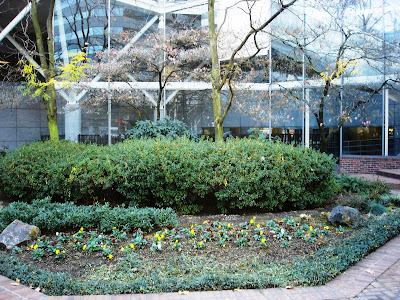 The island of landscaping beside the offices at 26 SW Salmon is location of the back walls of Hurgren and Shindler in 1873 It is the point of origin of the Great Fire. It is also where fireman Thomas Lawson fell and was seriously injured. The fire spread to a neighboring stable. Within minutes the north half of the block was engulfed. Flames were shooting in all directions, fanned by warm winds, which were rising with the sun. The fire jumped First Street and spread to a carpenter shop, then Schades Saloon and the Multnomah House. It leapt Salmon Street and spread to a harness shop, a livery stable and the Metropolis Hotel, which went up so fast that it was impossible to save any of its contents. 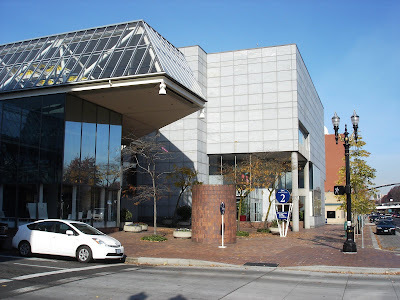 It crossed Front Street and spread north toward the new downtown and south toward Portland’s larger industries. -The Daily Oregonian, Monday August 4, 1873, on the end of the Metropolis Hotel. 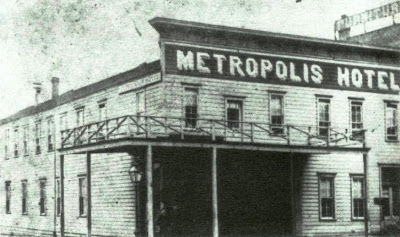 The Metropolis Hotel. Like many of the buildings in the older part of town south of Morrison, it was made of wood. 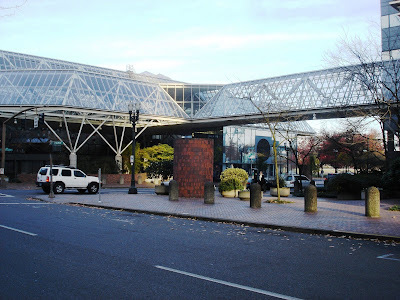 The northwest corner of Salmon and Front (Naito), site of the Metropolis Hotel. At 6:28 am in Salem, the telegraph keys in the Wells Fargo & Company office clicked to life. A message authorized by Portland’s Mayor Henry Failing was pleading for assistance from any fire departments within reach. Egbert Brown, a Wells Fargo messenger received the telegraph, sent a message to Salem’s Fire Department and ran to the Oregon & California Railroad station where the morning train to Portland was about to depart and convinced the railroad to hold the train. At the firehouse for Salem Capitol #1 Company, Foreman B. Crossman sounded the alarm. As the firefighters responded, they had no idea they would soon be bound for Portland. Capitol #1's engine was loaded on a flatcar. Oregon & California Railroad Engineer W.H. Callicott, a Portland resident, eased back the throttle and sent the train sprinting for Portland. Ben Holladay’s railroad was racing to save Front Street. One Hour and eight minutes later (58 miles!) the train pulled up to the O&C Ferry landing on the east bank. An Oregon & California Railroad train in the early 1870’s, near New Era, between Salem and Portland. Meanwhile, in Vancouver, a fire company was loaded onto the steamboat Oneatta, along with two companies of exhausted Federal troops, late of the Modoc War. One hour and fifteen minutes later, they were unloading near the fire. Wooden buildings between Yamhill and Morrison on the east side of Front, likely the Lick House and Kellog’s Hotels. The flames had advanced northward along the river on the east side of Front to the block between Yamhill and Morrison. There, a major effort was in place to save two hotels, the Lick House and Kellog’s, and in doing so, protect the magnificent St. Charles Hotel across the street. -The Daily Oregonian, Monday August 4, 1873. The Willamette Company #1 and Salem’s Capitol #1 companies were deployed in front of the Lick House and Kellogg’s with Columbia Company #3 mounting a rear guard action alongside of the river at the foot of Morrison Street, There they fought the blaze on Carter’s Wharf while knee deep in water. Nearby, a group of Chinese men had been rounded up by members of the Emmet Guard, part of the local militia, and forcibly impressed into service. The Emmet Guard was largely Irish (Judge Matthew Deady would refer to them as the “Finnian Guard”). Due to long standing competition for labor they were especially prone to the anti-Chinese bias endemic at the time. The Chinese were placed in a position of great danger behind the burning warehouses with their backs to the river working the pumps that fed the engines. While doing so, they had to be hosed with water from wharf above due to the intense heat. They were also subject to abuse. A soldier from the Emmett Guard, armed with a bayonet was seen forcing a Chinese man to walk barefoot over a burning boardwalk. “…one or two of the boys were rummaging the nooks and dark corners of the wharf for fugitive Chinamen. A score or more of these were later captured, and it was mirth provoking to witness the graces with which they followed their bell-weather, who had yielded to Sweeney’s wild objurgations. -The Daily Oregonian, Tuesday, August 5, 1873. The fight to save the two hotels between Yamhill and Morrison was a lost cause. The firemen backed across Front Street to mount a last ditch effort to save the St. Charles Hotel. The heat was such that the hotel’s large glass windows began to crack and shatter. “And looking over into that “fiery gilt-edged hell” we saw a gigantic body of fire rising so slowly and with such awful strength that it seemed some Vulcan striving to burn Scamander’s flood, this dying fiend lapping Walamet with his million tongues of fire! For an instant it stood erect like the fervid Noon instinct with a thousand suns, trembles for a moment while all around the air shimmered and shivered like a sensitive thing, and then launched outward, an avalanche of beaten devils, baffled of their prey. All attention in the area was concentrated now on the St Charles Hotel. From the top of its mansard roof, firemen played water downward. Wet sheets were hung from the windows to minimize burning debris from across the street. Eventually the fire east of Front Street burned low. By saving the St. Charles Hotel the fires northward advance was stopped, helped by Block #77, between Morrison and Alder, which had burned the previous December and remained vacant. The St. Charles Hotel the day after the fire. The two story building with three arches at the far end of the block is the Northrup and Blossum Building. It survives today as the southern half of the Northrup Blossum and Fitch Building. 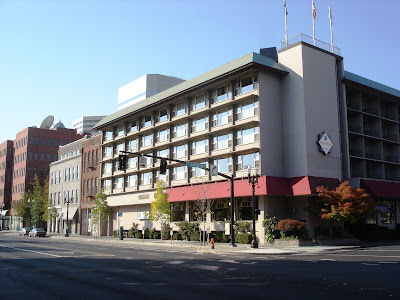 The site of the St. Charles is now the location of the Four Points Portland hotel. Note the three arches of the Northrup & Blossom Building at the end of the block that also appear in the 1873 view. The first two floors at the south corner of the Northrup Blossom & Fitch Building was the original Northrup & Blossom Building. It was later expanded. It is the only that building within that was within the fire zone that survives today. 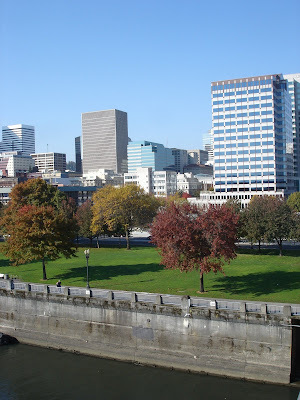 The site of Block 77 (seen from the Morrison Bridge), where fires northward advance was stopped due to it being vacant since burning the previous December. The “Sea wall” is a 1920s addition. By late afternoon it was all over. Nearly one forth of Portland was smoldering ruins. Over twenty two blocks had burned from Yamhill to Clay, bounded by the river and Second Street. The Congregational Church, on Second, between Jefferson and Madison. –From Harpers Weekly, Saturday September 6 1873. Instead of fire fighters, the evening trains brought sight-seers. The streets were filled with the dazed and incredulous while exhausted fire fighters worked on hot spots into the night. The scope of the destruction was difficult to comprehend. Losses would eventually be calculated at $1,182,325 with only $258,000 insured. To give an idea of the scale of the loss, the Portland City Treasury had closed out the previous year with a balance of $2,247 in the General Fund. The oldest, poorest and most industrial parts of the city were hurt the worst, while the newer business district on First Street went largely unscathed. Over two hundred dwellings and one hundred stores were lost. Two of the city’s fire houses, five hotels, three foundries and two sash factories were burned down. The Oregon Iron Works were severely damaged. In a Portland calamity, the store of coffee dealer J.F. 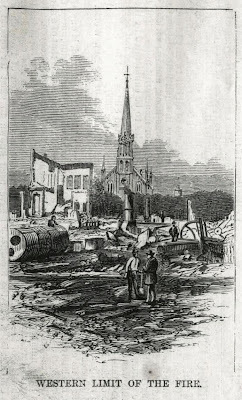 Jones and the brewery of Samuel Sykes were destroyed. No lives were lost, but there were serious injuries. Mopping up hot spots, looking towards the northwest. –From Harper’s Weekly Saturday September 6 1873. As the shock wore off, anxiety set in. Investigators found the origin of the fire at Hurgren and Schindler’s suspicious and many noted the fire restarted outside of the fire zone numerous times as the day wore on. There was little doubt it was set on purpose. There was fear the flames would return. Mrs. Allen, this is to warn you not to hire any more chinamen remember, saturday. -A discovered note, quoted verbatim in the Daily Oregonian August 9 1873. 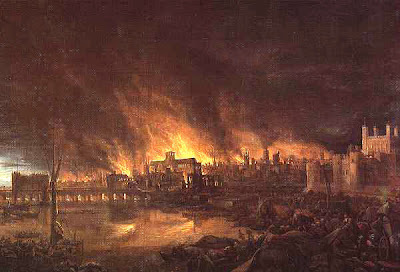 No further arson followed, nor was anyone ever charged with setting the Great Fire. The fire zone, from the southern boundary at Clay Street, looking north. The street to the right is Water Street, which at one time ran block closer to the river than Front in the area south of Main where the shoreline swung east. Front Street is on the left. The St. Charles Hotel is in the distance. Roughly the same place, November 2007. The fire zone or “Burnt District” viewed south from Salmon. –Samuels Directory for Portland Oregon 1874. “The Burnt District” was Portland’s first urban renewal area. Rebuilding began almost immediately. Within a week advertisements from business lost in the fire would appear, using the verb “phoenixing” or “phoenixed” to describe their return from the flames. Meetings “of the sufferers” were held at the courthouse. A “Committee on Plan of Action” was appointed. Offers of aid came locally and abroad. Some landlords ran advertisements offering lodging rent free for as long as it was necessary to recover. Mayor Henry Failing refused outside aid, choosing to rely on Portland’s natural self-sufficiency to guide its recovery. It was a very controversial decision. As the city rebuilt, there was a proposal to widen the streets from sixty to eighty feet, but new construction outpaced any impulse to plan. Tested by Fire. The Pearne and Poppleton buildings were destroyed in the fire, but not their cast iron fixtures. The buildings larger successors remain to this day on First between Yamhill and Taylor. They incorporate the original columns and pilasters which survived the fire of 1873. Portland recovered quickly, but the city’s confidence and optimism, the belief that its population would soon double, that business would increase a hundred fold, took longer to return. By the end of 1873, the entire country was in recession, sparked by the actions of financier Jay Gould. The dream of the Portland, Dalles and Salt Lake Railroad vanished. Portland would not be connected with the national railroad network for another decade. Also lost was the imminent hope of a bridge across the Willamette. Portland would wait another fourteen years, until the construction of the first Morrison Bridge in 1887, to be connected with the east bank. A casualty of the recession was Ben Holladay. His Oregon and California Railroad would remain stalled in Roseburg for another decade. He managed to hold on to 1876, when he was replaced by the railroads German investors by Henry Villard. Before that, he was able to back loyal a loyal minion Dr. James A Chapman, in the 1875 race for Mayor of Portland. Chapman was elected by six votes over incumbent, (and outside aid refusing) Henry Failing. Despite the hopes of the “28 Strong Men,” anti-Chinese sentiment in the city suffered a set back. It was soon replaced by alcohol as the issue main issue of the day. Within a year, Portland women, such as Abigail Scott Duniway, would be facing down the owner of the Webfoot Saloon (which had survived the fire) in protest. It would lead to stronger stuff. Once Portland’s women organized, the idea of the right to vote was not far behind. Willamette Engine Company #1 in 1875 in front of their fire house on Morrison between First and Second. It was one of three companies that did not loose their home in the fire. 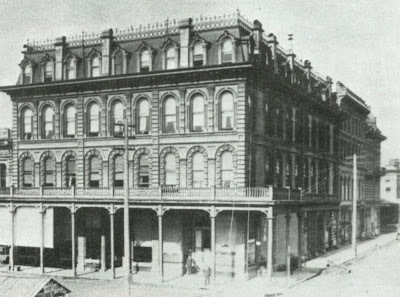 The St. Charles Hotel, which they were instrumental in saving, is the large building a block away on the right. The undersigned having bought out the above Restaurant, beg leave to announce to the public and his friends in general, that he has opened this Restaurant on a first class style. The Proprietor having engaged a first-class cook from California, and entirely renovated the place, respectfully ask for a share of the public patronage, and will always endeavor to satisfy his patrons. He will always have on hand, day and night, the best the market can afford. Private Saloons for small parties, and dinners and suppers served on short notice. Separate entrance for the ladies. At the Pioneer Wood yard, foot of Washington Street. “Time is the fire in which we burn” –Delmore Schwartz. Charter of the City of Portland 1872. The Daily Oregonian, July and August 1873. The Democratic Herald, East Portland April 11 1872. “The Early History of Transportation in Oregon” by Henry Villard. “Fares Please! Those Portland Trolley Years” by John T. Labbe. The Graphic, October 18 1873. 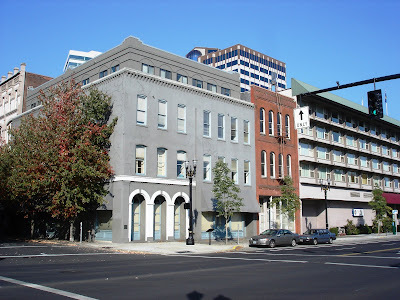 “The Grand Era of Cast-Iron Architecture in Portland” by William John Hawkins III. Harper’s Weekly Saturday September 6 1873. “Merchants, Money and Power” by E. Kimbark MacColl. “Pharisee among Philistines”, the Diary of Judge Matthew P. Deady edited by Malcolm Clark Jr.
“Portland Fire and Rescue” by Brian K. Johnson and Don Porth. Samuels Directory for Portland Oregon 1873. Samuels Directory for Portland Oregon 1874. “The Shaping of a City” by E. Kimbark MacColl. “Skidmore’s Portland” by Eugene Snyder. “Uphill Downhill Yamhill” by John M. Tess. “War on the Webfoot Saloon” by Malcolm Clark Jr.